Growing tomatoes is an interesting application of SPLat. It just so happens that our very first online sale, in 1996, of a SPLat controller was to a gentleman in Mississippi, who used it to control his tomato hothouse. This case study is from Arizona, 15 years later. Denny Graham may be "only" a one-off hobby customer, but hobbyiest often have the more interesting and innovative applications of SPLat. And sometimes a hobby project may lead to bigger business - From little things big thing grow. In Denny's case the big things are tomatoes, grown in his SPLat-controlled greenhouse. The control console with the SPLat controller is shown in the lower left corner. The greenhouse is cooled with an evaporative cooler. The humidity in the greenhouse ranges from 30% to 70%, and the temperature from 45°F to 90°F, though on occasion - when the evaporative cooler blower motor trips out - the temperature has gotten up to 110°F. This doesn't seem to effect the SPLat controller, but it's tough on the plants. As you see, the photo below shows the inside of the box. I'm not a electronics' guy and I'm a self taught GW-Basic and Visual Basic, and now, SPLat programmer??. 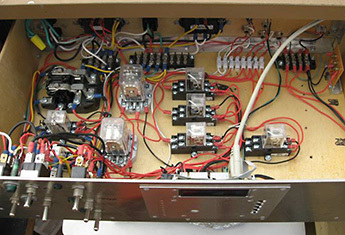 I only learn as much as I need to get the job done, so my circuits and the associated equipment design and control programs are at best, very basic, as in not elegant, but they get the job done. FYI, I've had excellent support from Fred Pacilli at Integrity Engineering Services, SPLat's USA rep. He's been very helpful.